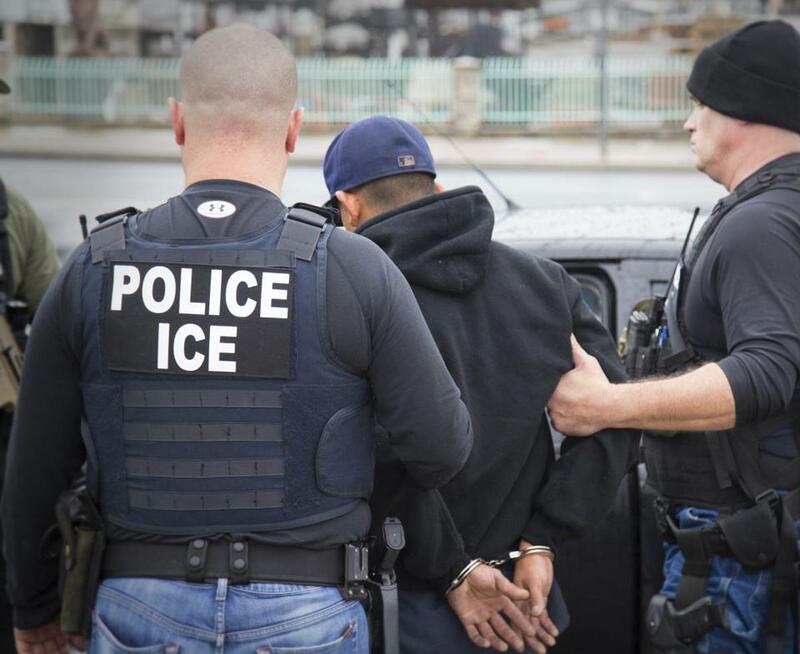 In recent months federal immigration agents have been positioning themselves in and around state, local, and juvenile courthouses in Massachusetts to arrest unauthorized immigrants who face even minor criminal charges, defense lawyers and prosecutors say. In April alone, more than 40 people were arrested by Immigration and Customs Enforcement agents who approached them on courthouse steps, as they got out of their cars, and inside courtrooms, according to the Committee for Public Counsel Services, which oversees the state’s 500 public defenders. There has been such an increase that state court officials recently reached out to ICE to talk about the arrests. The unusually aggressive tactics are part of a sweeping crackdown on undocumented immigrants by the Trump administration, which has expanded who can be targeted for deportation. In the first two months of Donald Trump’s presidency, the number of federal arrests in Boston of unauthorized immigrants more than doubled to 444 compared with the same time period last year under President Barack Obama. Defense lawyers say that many of their clients who are arrested are unable to get to court to fight the criminal charges against them. Prosecutors say the presence of immigration agents in courthouses could frighten away witnesses and victims involved in ongoing court cases who are in the country illegally. Massachusetts Attorney General Maura Healey said prosecutors in her office are worried the arrests will make unauthorized immigrants reluctant to report crimes and testify in court. The heightened enforcement comes as the Massachusetts Supreme Judicial Court weighs a case that could decide whether law enforcement agencies in the Commonwealth can comply with ICE detainers, a key tool federal immigration authorities use to bring unauthorized immigrants into custody. Jennifer Donahue, a spokeswoman for the state’s court system, said officials met with ICE leaders on May 30 after hearing about the arrests from judges, lawyers, and court security staff. “Trial Court officials were told that agents are in search of specific individuals and not looking to show up in courthouses to pick up . . . whoevermight be present,” Donahue said. But CPCS and other defense attorneys said those arrested often faced charges as minor as unlawful operation of a vehicle. In all cases, the charges were not serious enough to warrant state custody, lawyers said. Some were teenagers, and many had no prior criminal record, Wayne said. Most reported arrests were made in Middlesex and Suffolk counties, but they have happened across the state, Wayne said. None of the defendants had been convicted before they were detained, lawyers said, meaning that they were taken into federal custody without a chance to argue their case. “District attorneys are left with cases they cannot prosecute, victims are left without closure, and courts are left with default warrants and open cases that may never be resolved,” Wayne said. Shawn Neudauer, an ICE spokesman, said the tactics are not new and reflect US Attorney General Jeff Sessions’ order that allows agents to target an expanded pool of immigrants who came into the country illegally. During the Obama administration, ICE agents were instructed to focus on cases involving immigrants convicted of serious crimes. Advocates for tougher enforcement of immigration laws said as long as agents are not entering schools or churches to apprehend unauthorized immigrants, the strategy should be seen as a practical tool against those who have broken the law by coming into the country illegally. But defense attorneys said ICE’s maneuvers could have dire consequences for immigrants who may be eligible for permanent residency or some type of relief from deportation. An open criminal case will likely prevent them from gaining legal status, and will hurt their chances of returning to the United States legally if they are deported. Julio, a Salvadoran immigrant who asked to be identified only by his first name, said ICE agents went to his sister’s house one week after he went to a Middlesex County district court for a pretrial hearing in his case, an assault charge that arose from a fight with two other men. Julio, who has pleaded not guilty to the charge, was not at his sister’s house when ICE cameand has so far avoided arrest. Julio said he came to the United States three years ago after gangs threatened to kill him and his younger brother. After crossing the border illegally into New Mexico, they were detained by immigration agents, but allowed to remain in the country pending their claims for asylum. Meanwhile, he was issued a work permit that has been renewed every year. Since then, Julio, who — according to his lawyer — had no criminal record before his arrest this past winter, said he has attended all of his immigration hearings. He needs to resolve his criminal case or run the risk of losing his petition for asylum, but now is afraid he will be taken in by ICE before he has a chance to fight the charges against him. Julio, who has been staying with friends to avoid immigration agents, asked that his full name be withheld out of concern that his comments could be used against him during his immigration proceedings. Julio’s lawyer, Eduardo Masferrer, said that since President Trump took office, more than six of his clients have been taken into federal custody as they fight their cases. Others have even chosen not to post bail so they can be held in jails by the state, shielding them from ICE apprehension and ensuring they will get to court, since defendants held on state criminal charges are transported by county sheriff’s officers, not federal officials. Neudauer said that if a county prosecutor wants to pursue a criminal case against someone who has been detained, ICE will transport defendants to state court to fight their charges. But defense lawyers said some of their clients have missed hearings because ICE failed to bring them, even when a judge issued an order that they be transported to court at the request of the defense. “I’ve had multiple clients who have wanted to be brought in to fight their charges who were not brought in by ICE,” said M. Barusch, a criminal defense attorney based in Boston. In April, Barusch said he saw ICE agents arrest a man in his 20s outside East Boston District Court. The man was there to answer charges of unlicensed operation of a motor vehicle, a charge that does not carry jail time. But Barusch said he never made it to the courtroom, and was ultimately found in default. “This man was not the first man I have seen taken by immigration and I am sure he will not be the last,” Barusch said. Masferrer said defense attorneys speculate that law enforcement officials or court personnel may be tipping off ICE, strategy that could lead to a backlash in high-crime neighborhoods. Neudauer declined to say how ICE is tracking court hearings involving unauthorized immigrants. Others believe ICE is probably cross-checking public court records against its database of unauthorized immigrants.